Saturday morning Sept 16, I'll fly from SFO to JFK and on to ZUR. There I'll meet my good friends Siemen and Marijn for a week of climbing in the Silvretta region on the border of Switzerland and Austria. Sun Drive from ZUR to Klosters and hike in 5 hours to the Silvretta hütte (2397m). Perhaps do some rock climbs in the "klettergarten". Mon Traverse the Silvrettahorn (3243m) to the Wiesbadener hütte (2443m) in Austria in 7.5 hours. 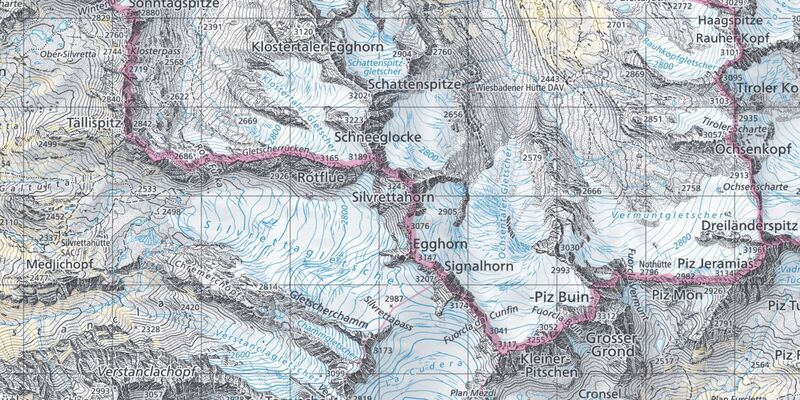 Tue Climb the Piz Buin (3312m) and the neighboring Dreiländerspitz (3196m) in 6.5 hours. Wed Over to the Saarbrücker hütte (2538m) in 4 hours with perhaps a summit on the way. Thu From the Saarbrücker hütte back to the Silvretta hütte in Switzerland in 4 hours. Summit Groses Seehorn (3121m) or Grosslitzner (3109m) along the way. Fri Spare "wiggle" day in the Silvretta hütte. Looking forward to it. Hope the weather works out. This late in the season we could get anything: ⛅☔❄🌞. I'll be sure to pack layers.